Taking a leisurely stroll along La Rambla is an absolute must when you visit Barcelona. The city's most iconic boulevard stretches for just over 1 km from Plaça de Catalunya to the sea. 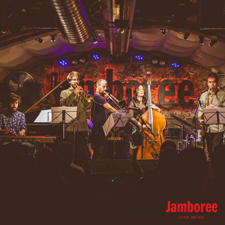 The Port Vell begins where La Rambla ends and offers a wealth of leisure attractions, bars and restaurants. In October it hosts the boat show, the Saló Nàutic Internacional de Barcelona. The Columbus Monument, stands proudly at the end of La Rambla and its viewing gallery boasts superb views of the sea and the famous boulevard below. The nearby Gothic shipyards, theDrassanes Reials, are home to the city's maritime museum, the Museu Marítim and if you make your way to the waterfront, and the Moll de la Fusta quay, you'll be able to see the Pailebot Santa Eulàlia, a historic schooner that celebrates its centenary this year. At this point, the walkway known as the Rambla de Mar, will take you to the Maremagnum shopping complex and L'Aquàrium. If you want to enjoy breathtaking views of the port, the sea and the city, we suggest you make your way to the top of Montjuïc. You can get there easily from Paral·lel, on the funicular and cable car. The panoramic views from the Mirador de l'Alcalde and Montjuïc Castle are truly spectacular and the park's green spaces and gardens are perfect places to stroll and relax. 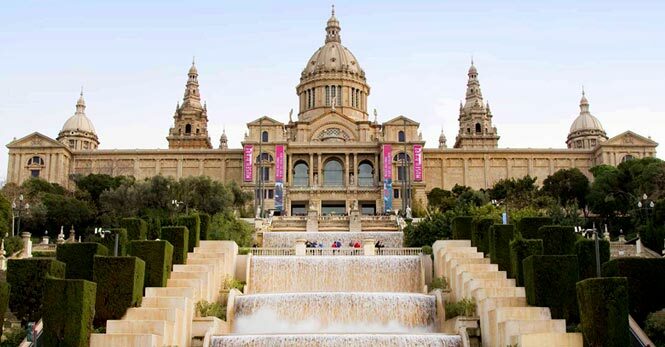 Montjuïc is also home to major attractions, including the Anella Olímpica, the Poble Espanyol and the Jardí Botànic (Botanical Gardens) and museums of the calibre of the Museu Nacional d'Art de Catalunya, the Fundació Joan Miró and the CaixaFòrum. 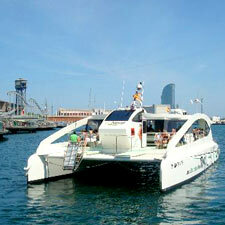 A ride on the eco-catamaran Eco Slim, is a great way to see the Barcelona skyline from a new perspective. The Eco Slim is the biggest catamaran in Europe and is powered by wind and solar energy. 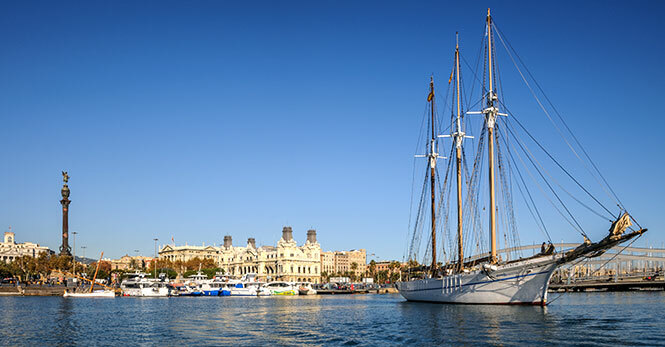 You'll set sail from the Port Vell, right in front of the Columbus Monument, and enjoy a fun and different 40-minute ride along the Barcelona coast. 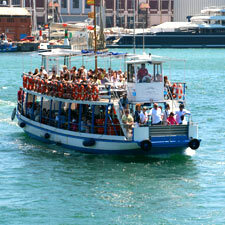 There are two options to choose from: a trip around the Port Vell, as far as Barcelona harbour, where you'll discover the latest in marine technology; or a trip to the Port Olímpic, where you'll be able to disembark and return later on another catamaran and feel the excitement of sailing on the Mediterranean. 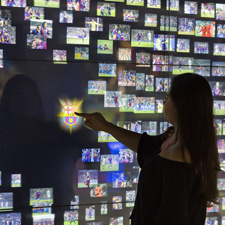 Afterwards, we suggest you make the most of the afternoon and visit the Aquàrium and explore the city on the Barcelona Bus Turístic, with a special package that combines both activities. Start off with a visit to L'Aquàrium, the world's most important recreational and educational centre specialising in Mediterranean marine life, where you'll find more than 11,000 examples of 450 different species. 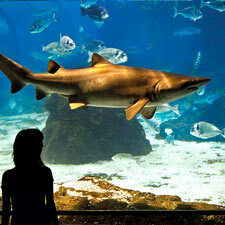 L'Aquàrium is home to a spectacular Oceanarium, which is the only one of its kind in Europe. You'll be able to walk through a transparent underwater tunnel among gilthead breams, moray eels, ocean sunfish, rays and sharks. At L'Aquàrium you'll find aquariums that are home to Mediterranean and tropical species, and be able to enjoy countless other activities. And after your unforgettable experience among the aquariums and undersea life, you can round off the day on the double-decker Barcelona Bus Turístic, which has panoramic views of the city and allows you to explore the city at your own pace. 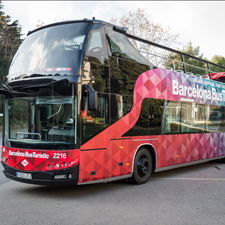 If you board the bus on the red route at the Port Vell stop, you'll be able to discover Olympic Barcelona and admire the iconic modernista buildings on Passeig de Gràcia, including the Casa Batlló and La Pedrera, and end your trip at the Parc de Montjuïc. 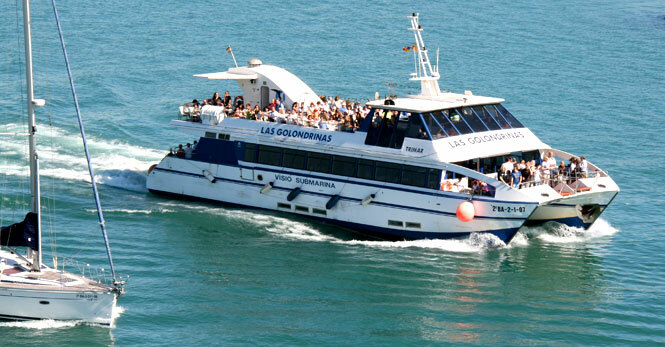 A sea cruise on the classic Golondrinas pleasure boats and a tour of the Columbus Monument are two wonderful ways of enjoying breathtaking panoramic views of Barcelona's port and skyline. 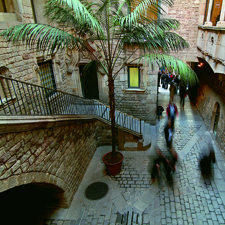 A trip on one of Las Golondrinas is one of Barcelona's most authentic visitor experiences. These iconic pleasure boats came into service 130 years ago, and you'll begin the day sailing through Barcelona harbour where you'll enjoy amazing views of the city and then head out along the Barcelona coast where you'll feel the sun and sea breezes caress your skin. After the 40-minute trip, the Golondrina will drop you at your departure point, the Moll de Drassanes, right by the Columbus Monument, which was built to mark the 1888 Universal Exhibition. You'll be able to admire the statue of Christopher Columbus and the sculptural ensemble at the base of its Corinthian-style iron column. 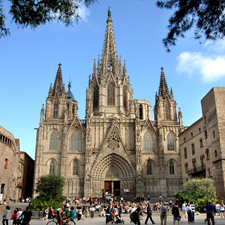 Afterwards, you can ride the lift – the first to be fitted in Barcelona – to the viewing gallery at the top, 60 metres above the city, and enjoy 360o degree panoramic views that will take your breath away: you'll see the Gothic Quarter and La Rambla; the Fòrum site and Port Olímpic; the city's vast green lung,Parc Natural de Collserola, with its major landmarks, the Collserola Towera and Tibidabo; and the mountain of Montjuïc. 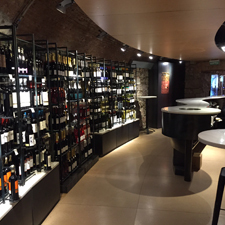 You can also complete your visit to thestrong>Columbus Monument with a tasting of wines and cavas from the Alella, Catalunya, Penedès and Pla de Bages Designations of Origin. 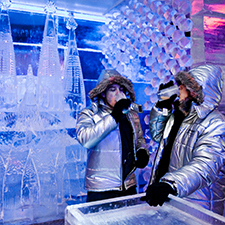 And after a morning out at sea and on the waterfront, what about an afternoon of culture? Make your way to the Parc de Montjuïc and take advantage of the special deals offered by the Articket Barcelona and visit two of the featured museums: the Museu Nacional d'Art de Catalunya and the Fundació Joan Miró. The Museu Nacional d'Art de Catalunya is housed inside the Palau Nacional de Montjuïc, which was built for the 1929 International Exhibition. It houses the world's finest collection of Romanesque paintings, as well as works by the leading artists of Catalonia's home-grown art nouveau movement, modernisme, including Gaudí and Casas, as well as Gothic art and paintings by the great European Renaissance and baroque masters, such as Titian and Velazquez. 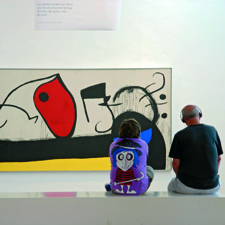 The Fundació Joan Miró houses the finest collection of works by the artist and hosts exhibitions of his paintings, sculptures and complete works on paper. A dynamic space showcasing Joan Miró's art alongside works by contemporary artists.